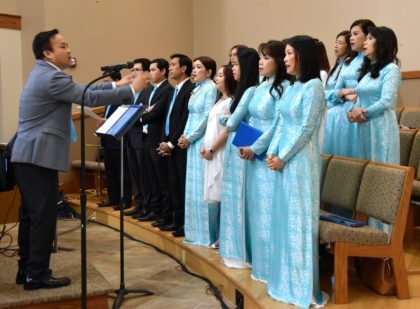 On Sunday, October 7, the Vietnamese worship community of Milwaukee celebrated its 40th anniversary. Since 2007, the community has been a part of St. Martin of Tours parish in Franklin, WI (suburban Milwaukee), ministered to by the Priests of the Sacred Heart (Dehonians). As Milwaukee became a hub for industry at the end of the 1800s a large number of Italian and Polish immigrants settled in the area. Just as the Germans before them, the new immigrants developed ethnic parishes where they could worship in their native tongue and follow the traditions of their homeland. When the Vietnam conflict ended in 1975, a small but quickly growing Vietnamese community took root in Milwaukee. Fr. John Thanh Hùng, a Vietnamese priest who had been studying in the area during the conflict, remained to minister to fellow exiles from his homeland. The group gathered for liturgies and for special celebrations, such as Lunar New Year. Initially the Vietnamese Catholic community found worship space at St. Anthony’s parish on Milwaukee’s south side, a parish that already had two distinct communities in place: one English-speaking and the other Spanish. When the community had a difficult time finding a Vietnamese-speaking priest, they turned to the Priests of the Sacred Heart. Fr. Francis Vu Tran, an American SCJ originally from Vietnam, had been assisting with the community. When the Dehonians made a commitment to serve the Vietnamese in the Archdiocese of Milwaukee in 2007, Fr. Francis became the community’s first SCJ pastor. Fr. Francis is now superior of the District of Vietnam and Fr. 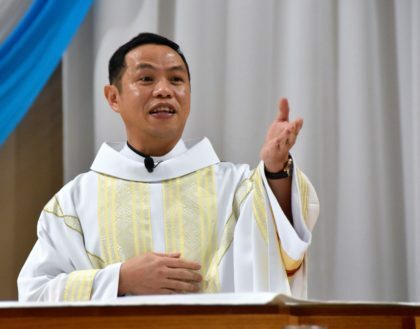 Joseph Quang Tran, SCJ, a member of the district, is now pastor to the Vietnamese community in Milwaukee, as well as associate pastor of St. Martin of Tours. 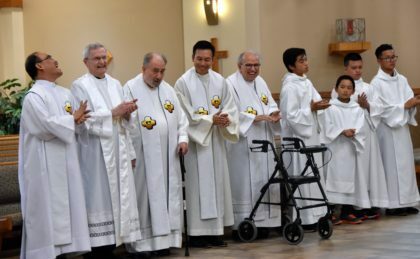 Other SCJs who have served the Vietnamese community include Fr. Thi Pham and Fr. Joseph Dinh. Fr. Terry Langley, SCJ, is pastor of St. Martin of Tours. Regular Mass attendance is usually about 300 parishioners, but that number more than doubles for special events, such as 40th anniversary parties! The Vietnamese worship community is not a separate parish within St. Martin of Tours. There are special Vietnamese celebrations and cultural activities, such as Tet (Vietnamese New Year; one of the most important celebrations in Vietnamese culture) but they are events hosted by the full parish and welcome to all parishioners. And while language is a challenge for older Vietnamese to fully integrate into the parish, younger parishioners –– especially children –– easily mingle with their peers in catechism classes and other parish activities. Several SCJs took part in the anniversary Mass, including two former pastors: Fr. Anthony Russo, SCJ and Fr. Yvon Sheehy, SCJ. And at the end of the Mass a birthday cake with “40” in candles on the top was wheeled out. But it wasn’t in honor of the Vietnamese community, it was for their pastor, Fr. Joseph Quang, who turns 40 himself on October 9. The Vietnamese language Mass at St. Martin of Tours is at 12:30 p.m. on Sundays. Anyone is welcome to attend.